Well they're strung up and the cones are settling. It's important to start with a high action and then let it sink as the parts get used to each other. The pic shows one of them being darker but that is a trick of the light. 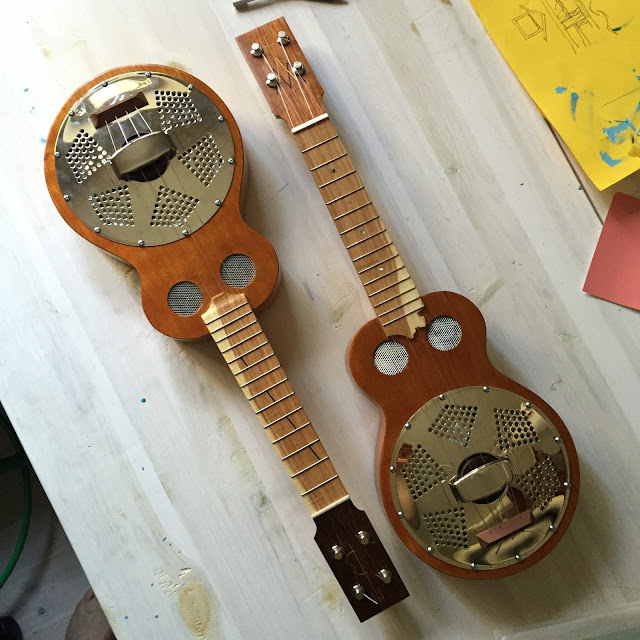 I promised a friend he could have a go before I ship them, but after that I'll unleash them for what is to be the Wörld's Löudest uke group - one Argapa resonator is already there waiting for these two. And a pic of the stringholder you saw in the latest post. I hope I get the time to make a wee vid of them, but the week is insane with all end of term concerts, parents' meetings at school and loads of other stuff. Tonight I haven't got the best of pics, or the complete story of a finished step. The shite pics are as they are because the phone was connected to the workbench-of-rock amp with a short cord, so I couldn't really wield it. And the step is unfinished because it took longer than I thought it would. But I have good news and that's why I blog anyway. I think I can finish the two resos this week. Hear that, Andy and Bernard? Maybe I should think of a price soon. 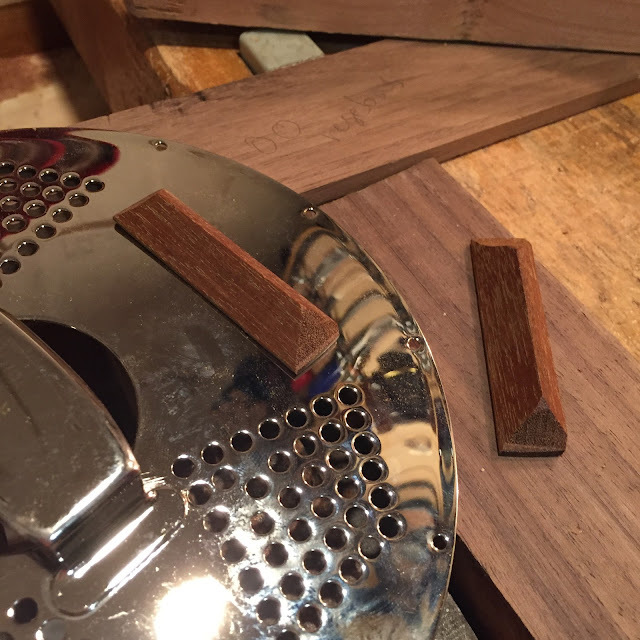 I made the stepped holes for the tuners but put those on hold because I need to make stringholders first. It feels more right. So I dug out a bridge sized piece of ipe, a wood used for outdoor furniture and other stuff. I got it as a sample to the office. I marked a cut line at an angle since I need a certain width to cover the holes in the cover plate. 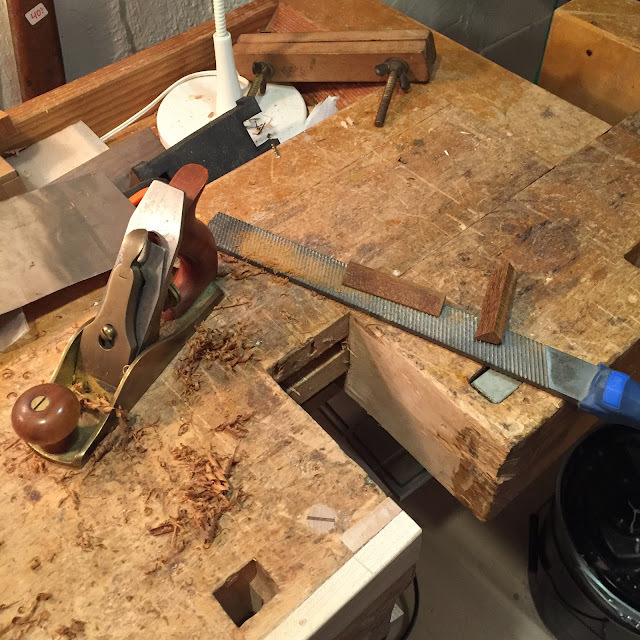 After I ripped it on my table saw I used a no.1 plane and a milled tooth file to shape the upper sides. 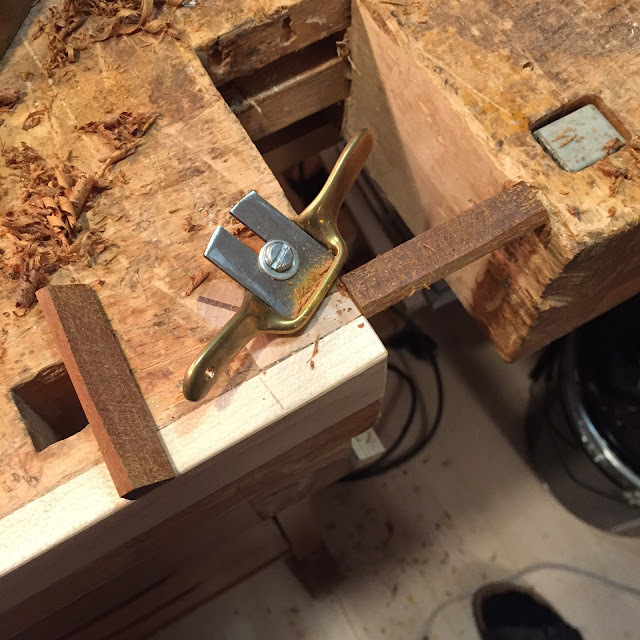 A small spokeshave with a rounded sole made the bottoms concave. 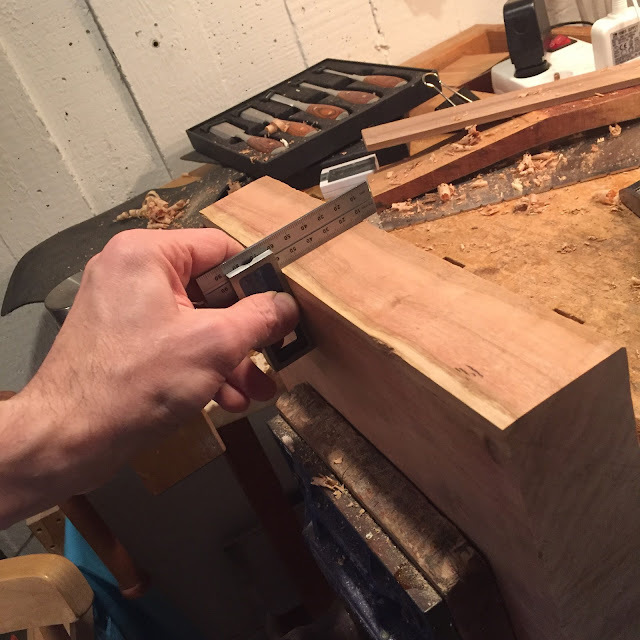 Ipe is quite difficult to work but with sharp tools it's doable. 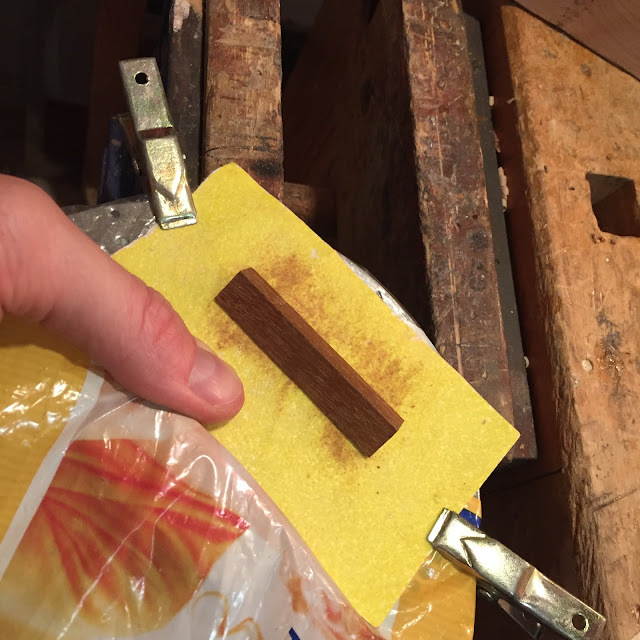 Fine tuning the fit with sandpaper on the cover plate. And here's where we're at. 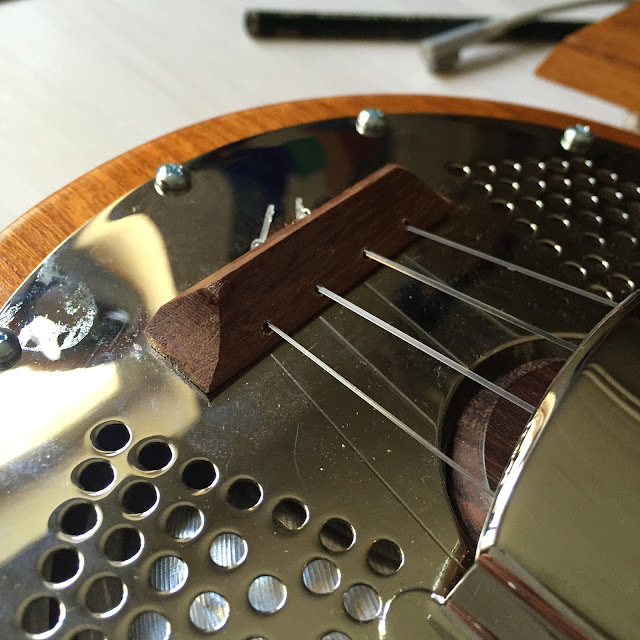 As I told you they're not done, I must drill holes for the strings and secure the blocks with screws from the underside. And the more observant among you are right - it is a brand new shape. I could settle for one shape and stay with that but as long as the holes are at the correct distance and angles any shape works. 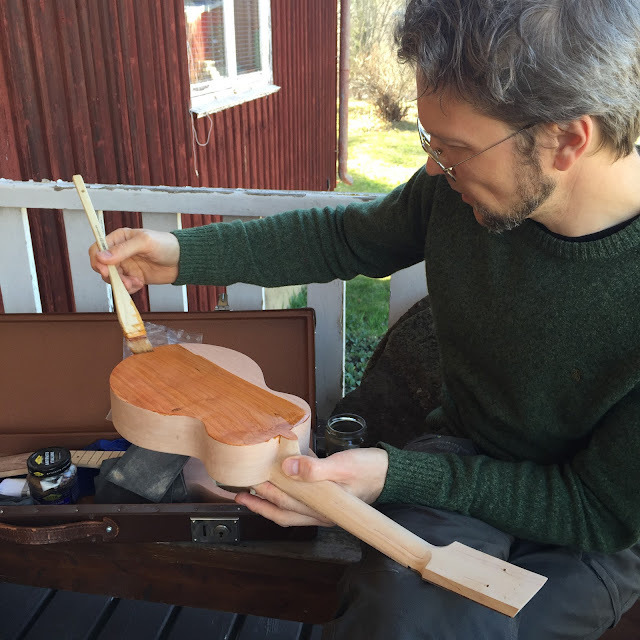 Working with string holders also brings out the glue gun, a tool otherwise far away from all things related to lutherie. Anyone besides me thinking things have gone far to smoothly lately? That one good thing has led to the next, no worries and no setbacks? Well it's time for an uncensored reality check. 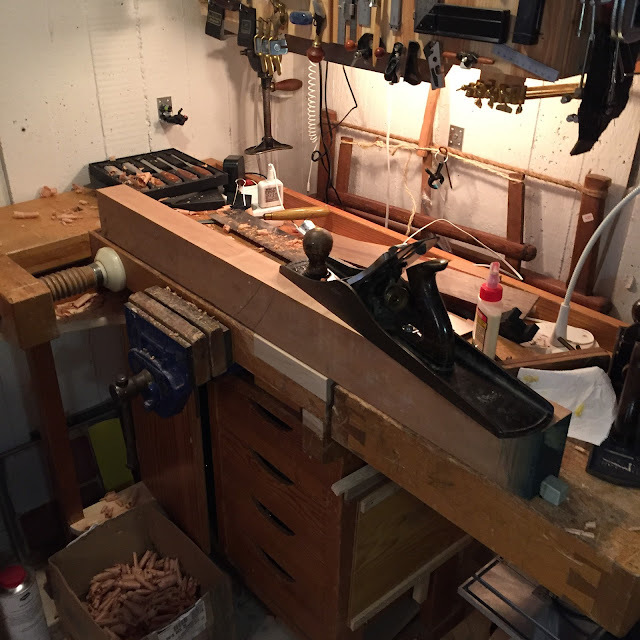 First I thought I shouldn't post pics of the crap but after all, this is a public service blog for all those wrestling with building (or more likely, wrestling with finding anything better to read). 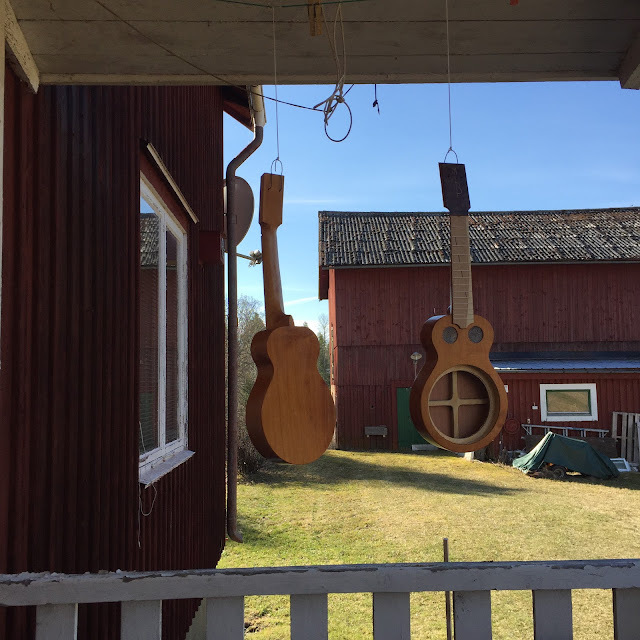 Andy's and Bernard's ukes are almost done, I left the shellac from last weekend to cure this entire week. 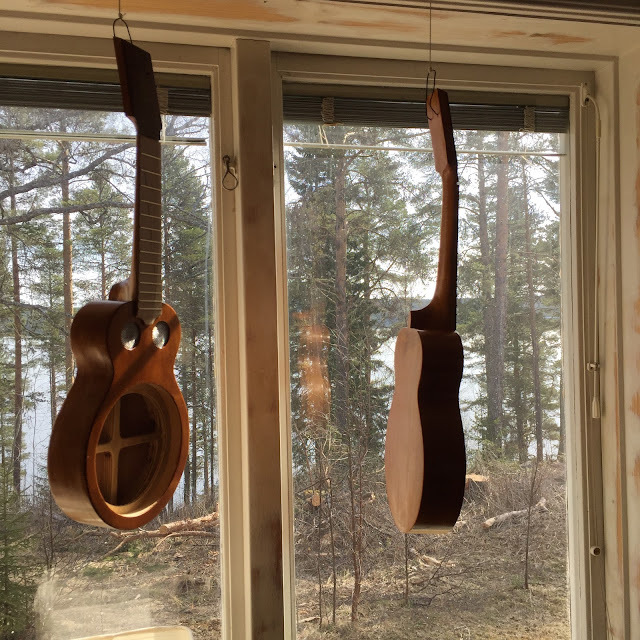 A glaze coat went on today and maybe it's time to drill the holes for tuners and cover plate screws soon? But what have I been up to in the mean time then. 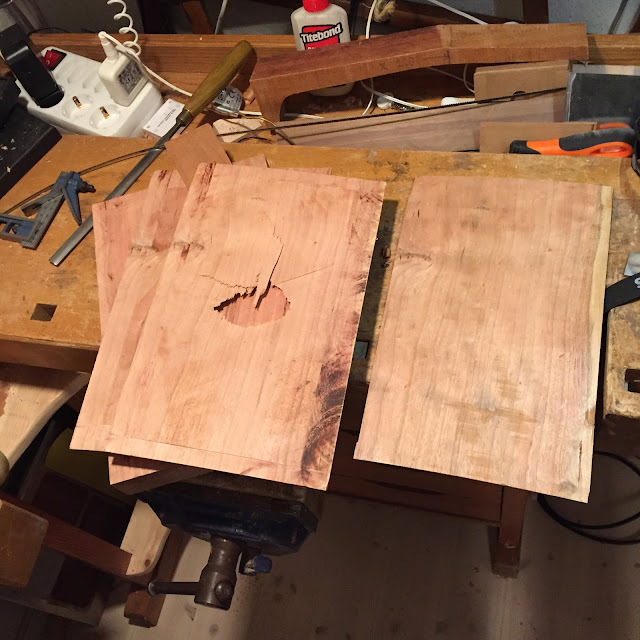 I decided to resaw some cherry for two more resos. 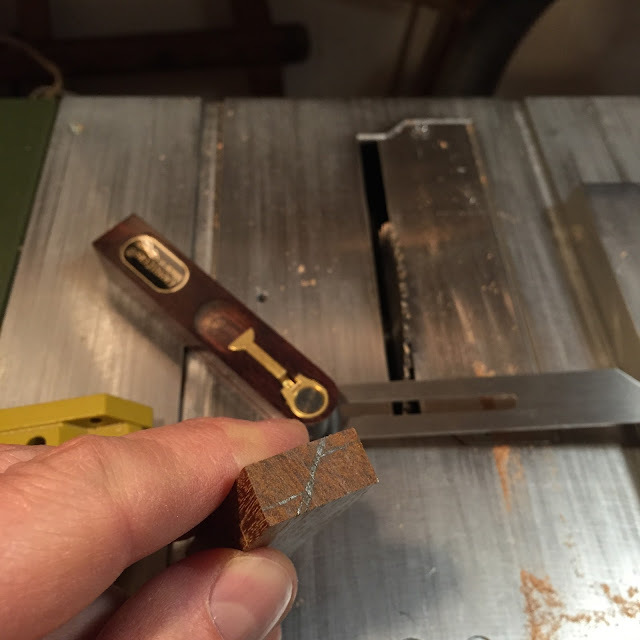 I planed a block, making a face flat and smooth, then all the edges at right angles to that face. And a longer one for the sides. 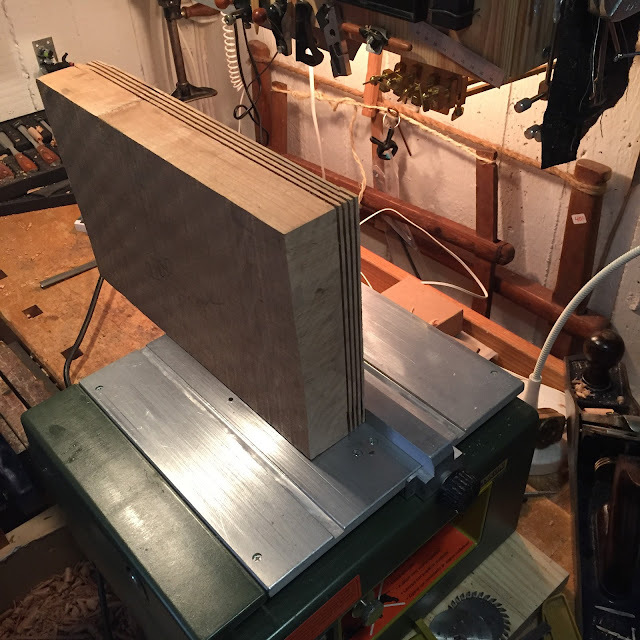 But to save some time and effort I skipped the kerfing plane and made the kerfs on the mini table saw. 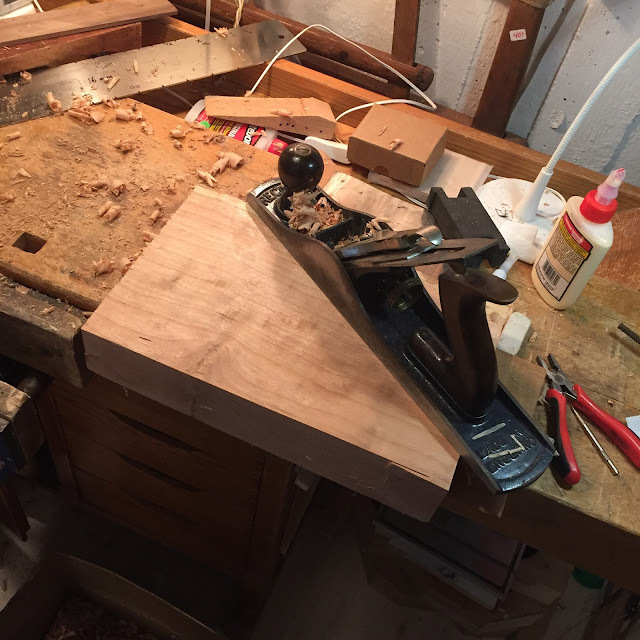 I made the cuts at the same distance I would with the kerfing plane in preparation for the frame saw. Do they seem a bit close together? Stay tuned. And here it started to proceed southwards. 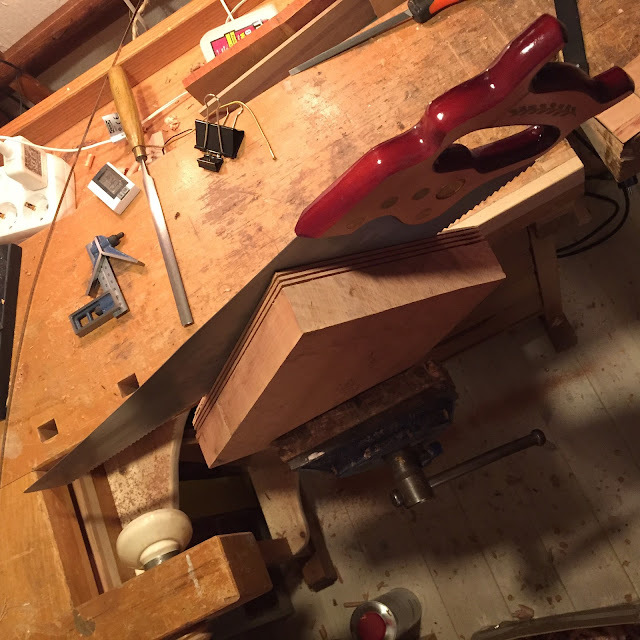 The frame saw is at the cottage so my Pax rip saw was called into duty. It's a very good saw. But it lacks the tension and the discipline of the frame saw. Well. We need kindling for the fire too don't we. The frame saw is on its way home fanx to my mom who was in its vicinity today. This wood is more or less wasted. Maybe I can get some headplates out of the remains if I can get over my disappointment and run it through the sander. Moral of the story today; don't try to do advanced stuff with tools that aren't suited. The Pax saw would probably have done ok in mahogany or ash, but cherry and other species have fibres that make the saw wander. 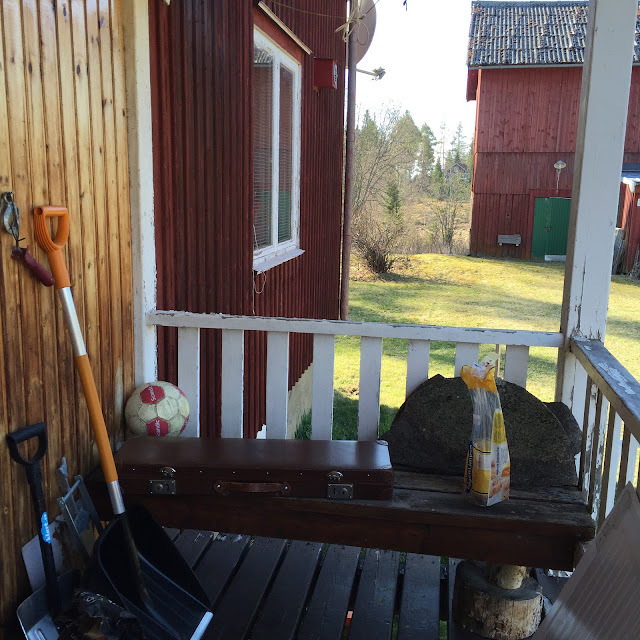 I'm 600 kilometers north of Stockholm, to help my brother in law clear out a house. But I brought the mobile finishing workshop, an Argapa exclusive. Where it is? In the antique case of course. 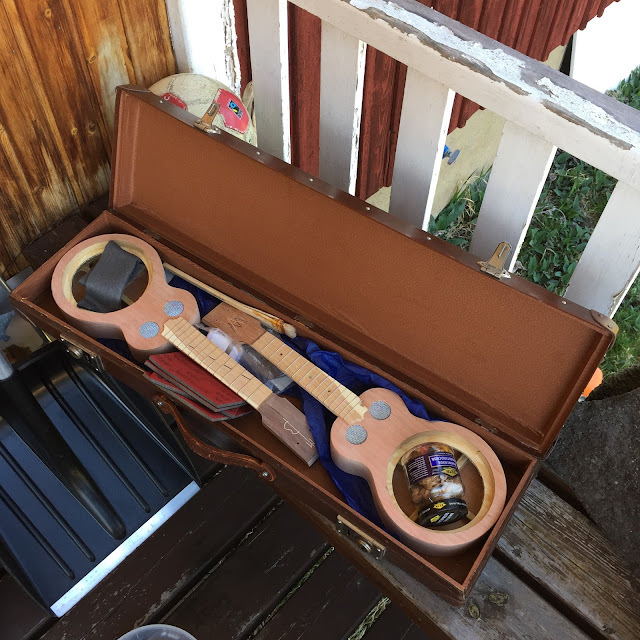 I bought the case to use it as a case for two ukes but haven't got around to furnishing the inside yet. For this however it was perfect. I brought scrapers, sanding pads, shellacing supplies and my brush. Then I coaxed a very handsome young man into applying the first coats of shellac. Over the course of yesterday I (he) applied several coats, levelling them between with scrapers and steel wool. And then they hung to dry. Maybe even to catch some tan, cherry will do that. And today I switched to the muneca and padded on a couple of coats. No oil yet but I think I will have to use that soon. And now they hang inside the house.